There’s no shortage of food recipe sites on the web for virtually any kind of food. In fact, trying to find a recipe online can be overwhelming with all of the options available. 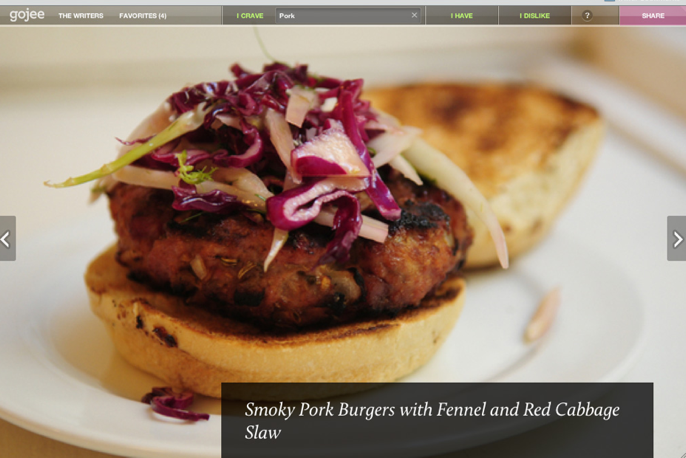 Enter recently launched foodie favorite Gojee, which curates recipes from food bloggers around the web in a visually beautiful way. On Gojee, you can search for recipes by ingredient, either via ‘cravings’ or by one ingredient you have in your pantry. You can also input your dislikes or allergies and Gojee will make sure to surface recipes without these ingredients. So say I had leftover snowpeas in my pantry, I can enter that query and Gojee will show me all the recipes that include that ingredient from the many food blogs it curates data from. The site presents a beautiful image of the food along with a list of what else is included in the dish, a short description of the dish, and a link to the full recipe on the food blog. You can also star the recipe to save it to your favorites. Besides the fact that all the recipes look absolutely delicious, one of the things that makes Gojee compelling is the photography and imagery that accompanies each recipe. These photos, which are taken by the food bloggers themselves, make you want to eat and create each dish. The startup has even caught the eye of celebrity chef Marcus Samuelsson. Gojee is also attempting to make your life easier by allowing you to import your rewards card info from your grocery store of choice, and the site will give you recipes based on the items you have purchased. Unfortunately, the feature is only integrated with New York grocery store chain D’Agostino but the startup hopes to add more stores in the near future. The end goal for Gojee, says founder Michael Lavalle, is to offer a more curated, personalized experience for finding recipes on the web. Currently the site has under 50,000 recipes, but is focused on adding quality recipes vs. quantity.